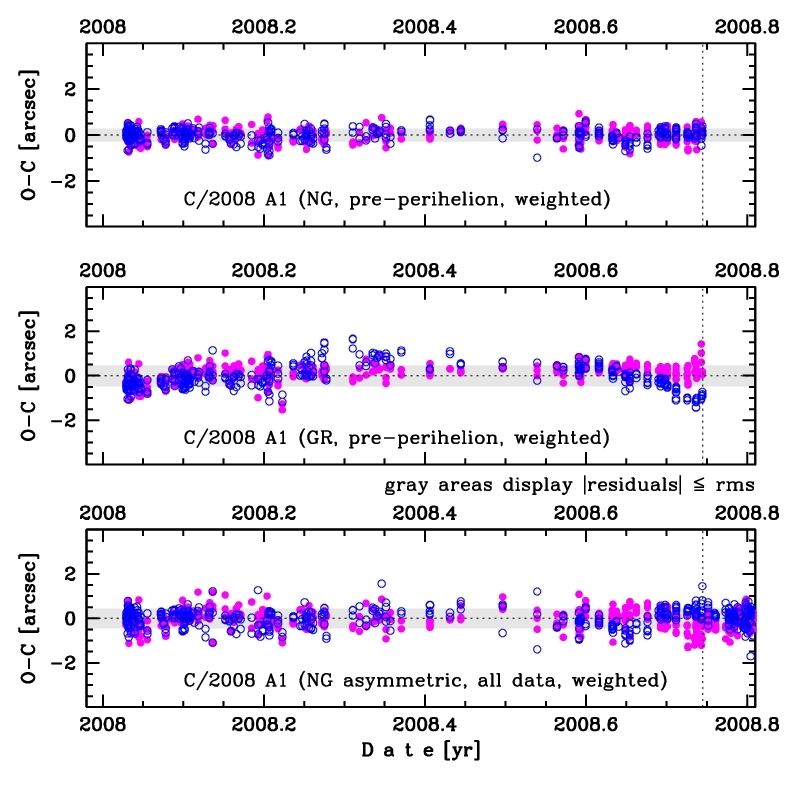 Trends in the O-C time variations even for asymmetric non-gravitational solutions based on entire data set (SSDP Cometary Note C2008A1N6-001, see just below) were noticed; O-C time variations of non-gravitational solution in comparison to O-C variation for pure GR solution are shown in the figure on the right. Due to its erratic behaviour, this comet should be examined in a special way and two dedicated separate non-gravitational orbits were determined (recommended for backward and forward dynamical studies, respectively). 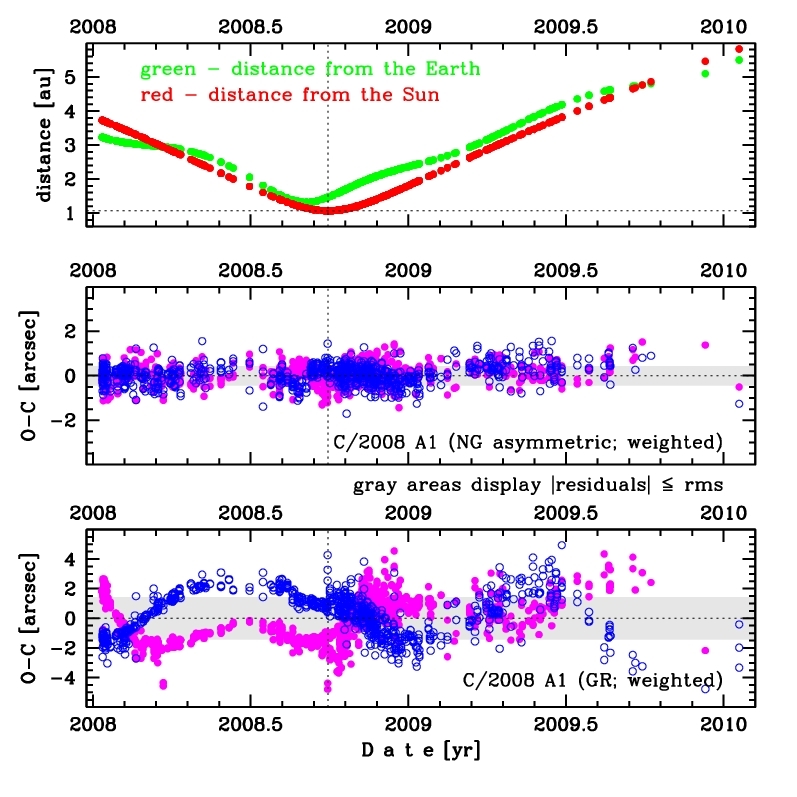 the most recommended two separate gravitational osculating orbits based on pre-perihelion (SSDP Cometary Note C2008A1P5-001, see below) and post-perihelion data (SSDP Cometary Note C2008A1R5-001 given at the end of this page), for studying the past and future dynamical evolution, respectively; O-C time vatiations for gravitational and non-gravitational solutions based on pre-perihelion data and post-perihelion data. This second type of solutions is recommended for studying the dynamical evolution of this comet. More details in Królikowska and Dybczyński, 2013. Note: Epoch is given in a format: yyyymmdd.d, time of perihelion passage in a format of yyyymmdd.dddddd. Note: Values of uncertainties of original/future orbital elements were derived using a swarm of 5001 osculating orbits of VCs (including the nominal osculating orbit given above) for original/future orbital evolution calclulations and then by fitting the distribution of a given orbital element of original/future swarm of VCs to Gaussian distribution. 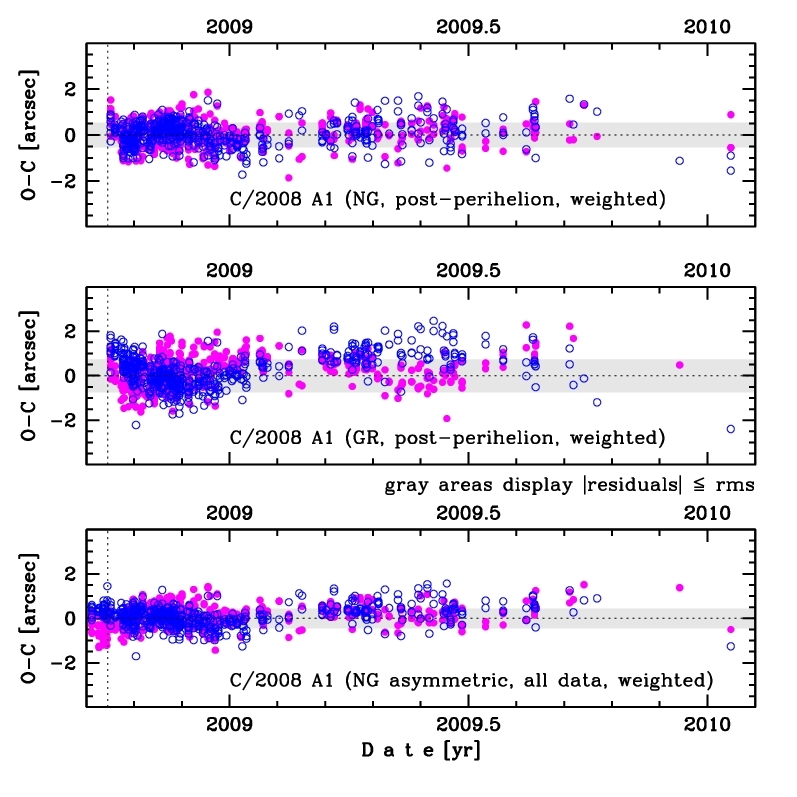 Original barycentric positions and velocities of 5001 VCs at 250 au from the Sun are given here (data format), i.e. before entering the planetary zone. Future barycentric positions and velocities of 5001 VCs at 250 au from the Sun are given here (data format), i.e. after leaving the planetary zone. Most recommended model for studying the origin of this comet. Note: Values of uncertainties of original orbital elements were derived using a swarm of 5001 osculating orbits of VCs (including the nominal osculating orbit given above) for original orbital evolution calclulations and then by fitting the distribution of a given orbital element of original swarm of VCs to Gaussian distribution. Most recommended model for studying the future evolution of this comet. Note: Values of uncertainties of future orbital elements were derived using a swarm of 5001 osculating orbits of VCs (including the nominal osculating orbit given above) for future orbital evolution calclulations and then by fitting the distribution of a given orbital element of future swarm of VCs to Gaussian distribution.